Built 1967-1970. Opened 24 Aug 1970. 2006 renamaned "Conexus Arts Centre" after a corporate sponsor. The centre contains a main hall (2031 seats), a convention hall (1400 seats) and various function rooms. 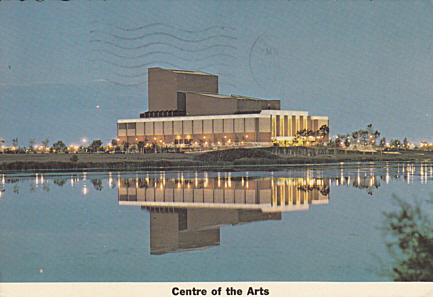 Front Text: "Centre of the Arts"
Reverse Text: "Regina's Centre of the Arts. Regina, Saskatchewan, Canada. Designed as a centennial project 1967, completed 1969"